The densely populated coast of Andalusia, stretching from Almeria to Tarifa, is Europe's favoured, all-year-round holiday destination and is commonly known as the Costa del Sol. It consists of a string of fine sandy beaches, where the average water temperature is 64ºF (18ºC), and picturesque towns that have abundant tourist amenities, resorts and high-rise hotels. Attractions include zoos, bullfights, water parks, casinos and amusement parks, like the renowned Parque de Attracciones Tivoli, or Tivoli World. The energetic city of Malaga, a sort of huge beach resort itself (and the birthplace of Picasso), is the capital of Andalusia and the gateway to the Costa del Sol. The most popular resort town on the Costa del Sol is Torremolinos, which retains some elements of traditional Spain, although most main streets are now pedestrian thoroughfares filled with souvenir shops and ice-cream parlours. Torremolinos is a popular party resort, perfect for all kinds of hedonistic fun in the sun. 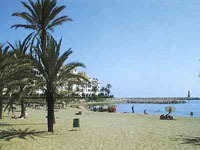 Marbella is another favourite, although it is a more elegant, upmarket resort, something of a playground for the elite. Those in the Costa del Sol yearning for some cultural sightseeing should venture to nearby Granada and its iconic Alhambra fortress, or visit the quaint and scenic villages of Nerja and Mijas to experience some authentic local flavour. Ronda also offers holidaymakers some respite from the revelery of the resort towns thanks to its beautiful natural scenery and wealth of cultural attractions.